To look at it you'd probably think that a lot of care and attention had gone into the design of the Samsung Galaxy Note 5, but there's an issue: sticking the S Pen into its housing the wrong way round can cause lasting damage to the phone. Where before you could only insert the S Pen one way in previous models, the new design allows the clumsy and non-attentive to stick the stylus in upside down, which means it can either get jammed in the slot or, even if you can retrieve it, potentially break the mechanism which detects whether or not the S Pen is attached to the phone. "We highly recommend our Galaxy Note 5 users follow the instructions in the user guide to ensure they do not experience such an unexpected scenario caused by reinserting the S pen in the other way around." In other words be very, very careful to always insert the S Pen the right way round. That in turn prevents other features from working. 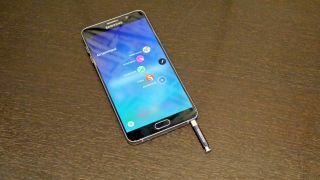 Normally the Galaxy Note 5 will automatically launch the S Pen menu if you remove the stylus when the screen is on - or a note-taking app if you remove it when the screen is off - but if it can't detect the pen then neither of these things will happen. The correct way to insert the S Pen is point first, but if you push the blunt top end in first then you won't be met with any resistance. At least this isn't a problem the Samsung Galaxy S6 Edge+ will face.